Sharing my hobbies and fun activities with you to hopefully provide some inspiration! One of the things I love about Summer is the variety of beautiful blooms that we get to enjoy in various parts of our garden. I would like to share with you some of the flowers I captured on camera. I am not sure of all their names but hope to one day learn. There’s something so uplifting about looking at, smelling and touching these magnificent creations. Enjoy! Sundays are usually a whirlwind of madness in our house as we try to get the kids out of the house in time for church. My husband and I teach classes before the service starts and on mornings like today when music practice is thrown into the mix, it is one busy morning. I love it! The morning started off early with worship practice. 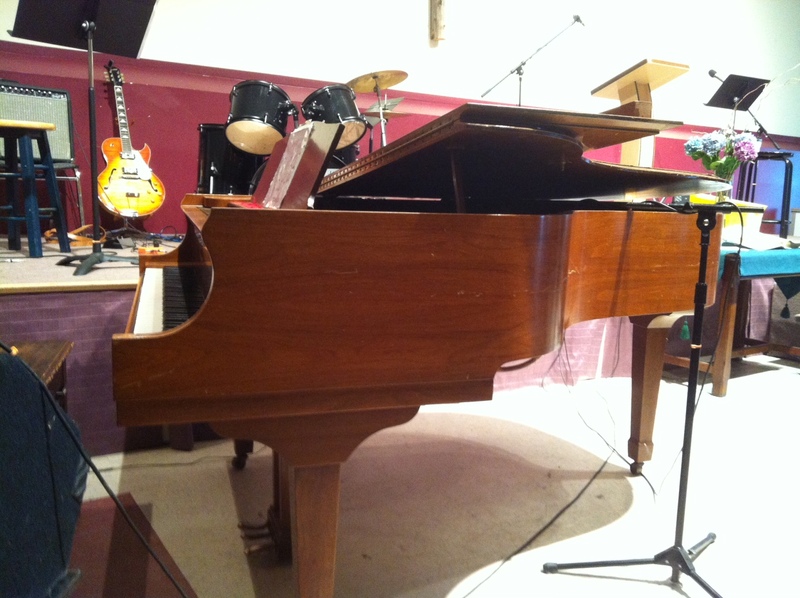 Depending on the Sunday, I play piano with different musicians which offers a nice variety of styles and songs. Today, I found the songs particularly reverent and despite a challenging practice on Thursday night as we tried to mesh together as a team, it worked out beautifully this morning. After practice was done, it was off to my class to prepare my sheets and props for the 4 to 5 year old kids. Despite the challenges of uncooperative or rowdy kids, teaching them is so refreshing. There is something about being around young children that just reminds me to have fun and appreciate the simple things. After the class, I ran down to the sanctuary to play piano for the service as I tried to untangle my own two kids from around my knees. I found it very inspiring that the pastor’s message today was on worship and how we are not there to gain something for ourselves but simply to glorify God and thank him for his goodness. As the service came to an end and the voices of the congregation rose up in volume and blended for the last song, it was just so beautiful. I didn’t want it to end! So despite the usual Sunday madness and the fact that we normally want to pass out on the couch after the service, it is always so worth it to be in the company of great people, lifting up our voices, hearing the laughter of kids and being surrounded by such a warm community! Some of my friends have requested that I add more topics to this blog that include my hobbies. I would be delighted to do so! To start with, I thought I would share some of my past and recent crochet projects, mostly inspired by my children. 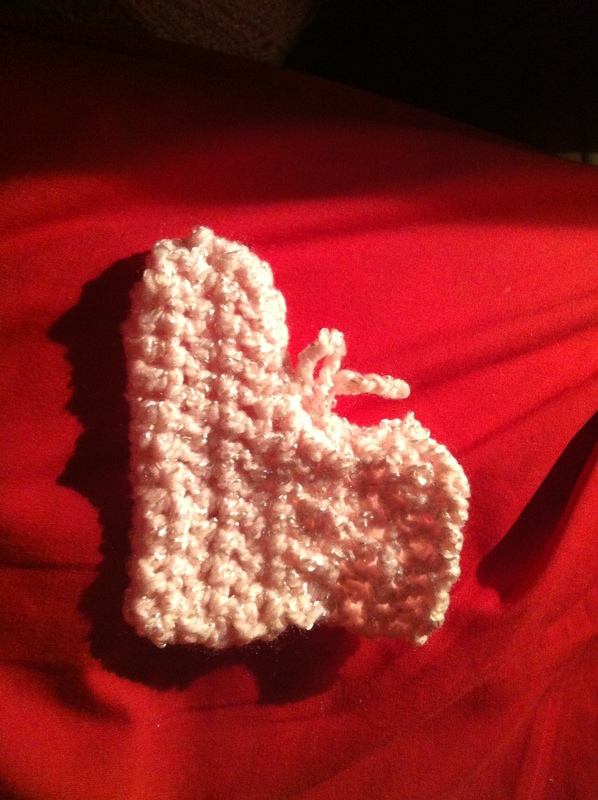 Crochet is a wonderful activity to help you unwind and whether you are a beginner or a pro, you can use whatever skills you have to create beautiful, meaningful gifts such as baby blankets, bootees, hats, scarves, mitts, bags, headbands, the list goes on! You may be wondering where to start if you have never before picked up a crochet hook (which looks like a miniature shepherd’s staff). I would highly recommend starting out with videos on Youtube. The benefit to watching a video as an introduction to crochet is that you will clearly see the techniques used in manipulating the crochet hook and you can even learn the different types of stitches (like double crochet, single crochet etc.). Once you are familiar with using the crochet hook, you can then start to look at books and patterns to make your projects. Trying to read a pattern before you have learned what the actual stitches are is like trying to decipher an ancient Greek text (which I could only successfully do with the aid of my nerdy multilingual husband). Youtube is also useful if you haven’t crocheted in a while and simply want to brush up your skills. So without further ado, here are some of my projects, mostly done while I was pregnant in preparation for a cute, cuddly baby. Links to the patterns are included. Happy Crocheting! 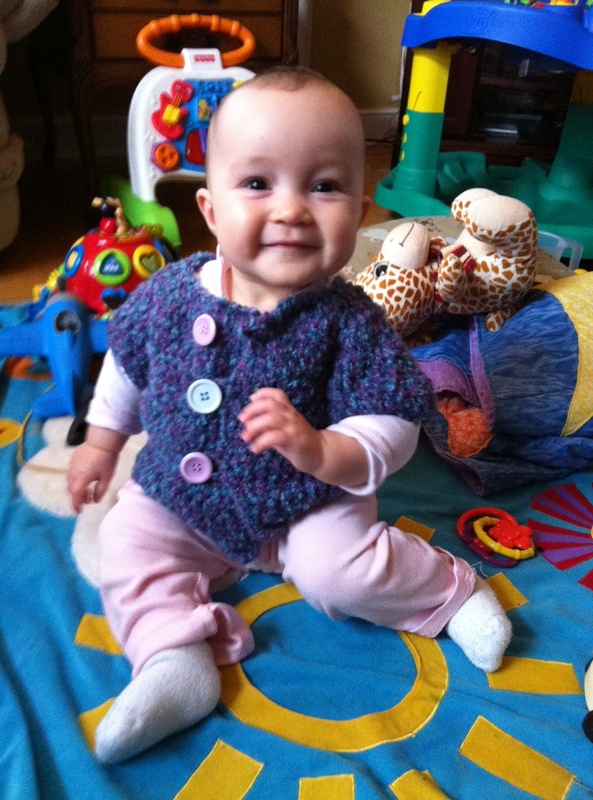 My daughter (when she was 9 months old) sporting a modified version of the baby girl sweater above. 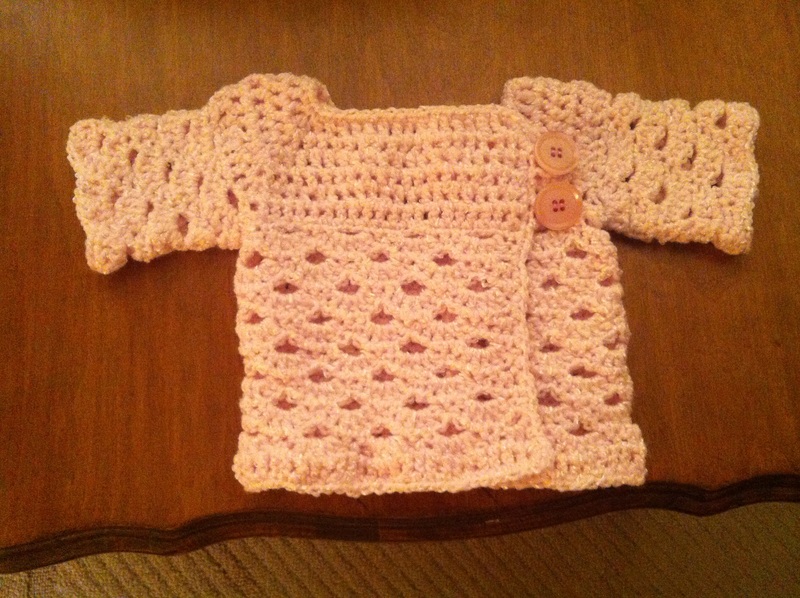 I used double crochet stitch for the whole sweater and used bulky yarn. 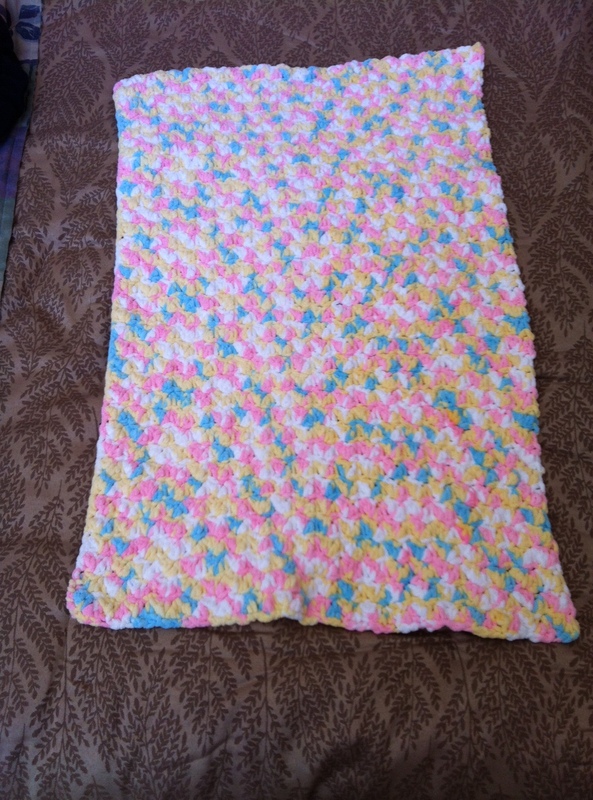 This is a very easy blanket which repeats the same stitches over and over again. 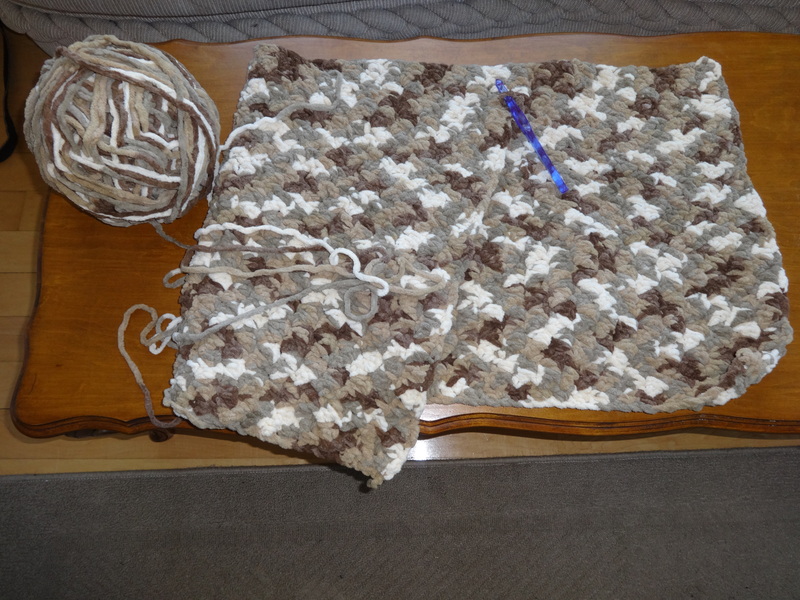 A good choice if you have to put together a blanket in a short time. My almost 4 year old insisted I crochet a blanket for him after he saw his sister’s blanket above. My husband also just recently placed an order!